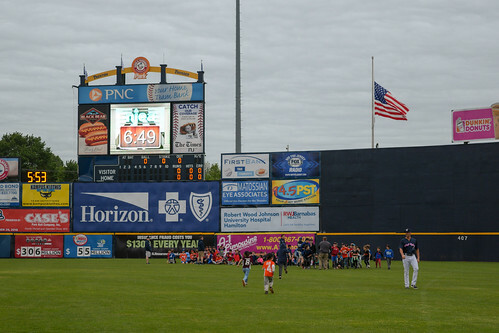 Last Friday was our Little League’s night at the Trenton Thunder. It’s fun, the kids get to walk around the field and stand by the players for the national anthem. Then we all get to sit together in the stands and watch the kids get hopped up on cotton candy and staying up too long past their bedtime. It’s a wonderful benchmark for me to see how my son’s perspective on the game has changed. Two years ago he was overawed by the field and couldn’t pay attention to the game. the highlight for him was when I surprised him with his very own Thunder cap. Last year he was getting into the action a bit and discovered the stats on the scoreboard. His interest in the stats and what they meant is partially what led me toward baseball cards again. This year? He’s keeping score, really paying attention to what’s going on, and has expressed an interest in getting autographs. My mother is totally laughing at me now. 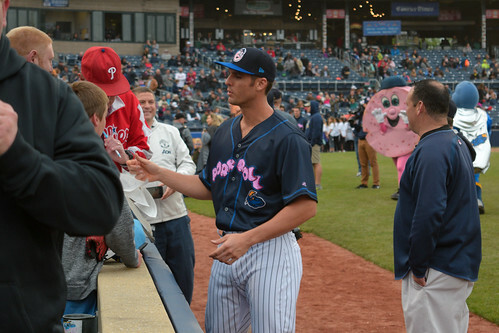 The big buzz from the kids in the know was that Greg Bird was rehabbing. * So a bunch of the kids had high hopes for getting his signature. Unfortunately for them Bird signed while all the kids were in the outfield preparing for the anthem. *Not being a Yankees fan I’m not in the loop with who’s rehabbing where. I missed out on Bird as well (was going to have to use my ticket stub like I did with Matsui) but did grab a photo. He was great though. Signed everything (sadly moving away from me). Posed for photos. Super-accomodating with the fans in a way that I’ve not seen from many players at any level of baseball. It was refreshing to see. The game itself was great. Minor league ball can be bad at times but this one was fast-paced with good pitching. Brian Keller only had one run of support but it was enough as he took a no-hitter into the 6th and finished with a nice line of eight innings pitched allowing no runs, one hit, and striking out four while throwing just over 100 pitches. Bird gave the fans a nice show with a solo homer for the insurance run in the 8th and the game was over in just over two hours. My son meanwhile had decided that he wanted to get his program autographed by Jay Bell. He’d seen my card earlier and since Bell is on the cover of the program this was a logical first step. Plus he sort of wanted to test himself to see if he’d even have the courage to ask. So we headed over to the dugout after the game to see if we could catch Bell. No luck. Instead, since it was only 9:00 I figured we could hang around the locker room door for a while. We ended up being there for an hour and I got to watch him transform. He was indeed too shy and let the first handful of players go. * Eventually though he gathered enough courage to ask Jhalen Jackson for a signature. And after that it was all easy and each success just made him happier and happier. *Including Dillon Tate who I would’ve chased down had he not been wearing headphones and giving off a clear “don’t bother me” vibe. It was a joy to watch and I understand why my mom was willing to wait so long for me during my autograph hunts decades ago. It’s nice to see kids just having fun being fans and appreciating all the players as part of the team. No focusing on the stars or prospects, instead all that mattered was whether they wore the uniform. Having him there put a smile on the players’ faces. 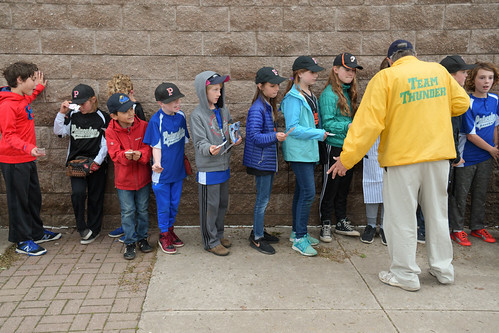 Most of them hung around to make sure they signed for the three kids (who were all sharing my son’s pen) and the energy of the little crowd was extremely positive. There was so much excitement whenever the door opened (except the one time they were distracted and someone scared them) that it rubbed off on everyone else. The other, more-seasoned autograph collectors all had smiles on their faces too and it ended up being a fun hour despite the cold. By the end of the night my son had no qualms about talking to the players and had quite a collection on his program. 17 autographs: 15 players plus 2 coaches including Jay Bell the ex-Major Leaguer. I’m just glad that most of the guys put their uniform numbers by their names so I could ID them. Brian Keller—that night’s starting pitcher who deserved all the congratulations we gave him. Jeff Hendrix—that night’s starting center fielder who drove in the go-ahead run. Mandy Alvarez—the 3rd baseman who my son was by for the anthem and who told all the kids asking him for autographs that he’d sign after the game. Chris Gittens—who drove in the winning run in extra innings in the previous game we attended this season. So yeah a success on all fronts. The card did get a bit of a chuckle from Bell and he commented, “that was a long time ago,” when he signed it. I also got Bell’s 1994 Pacific card signed. I would never have attempted a glossy card like this when I was a kid but I wanted to see what happened if you rub it with a dryer sheet first. Looks like a decent tip. I’m not a huge fan of this set/design since it runs a bit low-contrast in its photo processing. That low-contrast look though really makes a signature pop so I’m pleased with this as well. It was a good night for both of us. My son was extremely excited and happy and is already planning his next autograph adventure. Despite being two-hours past his bedtime he was all hopped up and took a while before he went to bed. Needless to say he has the bug. This entry was posted in baseball, collecting, family, Thunder. Bookmark the permalink. Your mom was indeed laughing. Seriously though – beyond overcoming his shyness and experiencing the joy of accomplishment/acquisition and the glow of camaraderie – your kid is learning about preparedness, patience, perseverance, politeness, respect for others, managing expectations, handling disappointment, AND what distinguishes good guys from jerks. These are all important life skills. Congratulations to both of you. PS: Whatever happened to Donell Nixon?